28 Indian Inventions that changed the world. 1. The Hindu Number System. With decimal place-value and a symbol for zero, this system was the ancestor of the widely used Arabic numeral system. It was developed in the Indian subcontinent between the 1st and 6th centuries. Aryabhatta invented zero, without which there is no binary code and computers. The Takshasila University was established in 700BC and Nalanda University was established in 4th century BC. 3. The concepts of Algebra, Trigonometry, Geometry and Calculus Originated from India. The evidence traces back to 1200 BCE. Ayurveda and Siddha are ancient and traditional systems of medicine. Ayurveda dates back to Iron Age India (1st millennium BC) and is still practiced today as a form of complementary and alternative medicine. Siddha medicine is mostly prevalent in South India. Herbs and minerals are basic raw materials of the Siddha system which dates back to the period of siddha saints around the 5th century BC. The Indian scholar Pingala developed a binary system for describing music in around 5th–2nd centuries BC. He used binary numbers in the form of short and long syllables making it similar to Morse code. 6. Cotton Cultivation and Weaving. Cotton was cultivated by the inhabitants of the Indus Valley Civilization by the 5th millennium BCE – 4th millennium BCE. The Indus cotton industry was well developed and some methods used in cotton spinning and fabrication continued to be practiced till the modern Industrialization of India. Well before the Common Era, the use of cotton textiles had spread from India to the Mediterranean and beyond. 7. Chandrasekhar limit and Chandrasekhar number. These parameters were discovered by and named after Subrahmanyan Chandrasekhar, who received the Nobel Prize in Physics in 1983 for his work on stellar structure and stellar evolution. The concept of Pi and an approximate value of it were first discovered by Budhayana in 800 BC they were later improved by Aryabhatta. Budhayana also devised the concept of Pythagorean theorem. 9. Bhaskaracharya calculated the time time taken by the earth to orbit the sun in 5th century BC. 10. Sir Jagadeesh Chandra Bose invented wireless communications in 1819. 11. The earliest medical encyclopedia. Sustura Regarded as the father of surgery wrote the Sushruta Samhita the earliest medical encyclopedia known to world during 1200BC containing 184 chapters contains descriptions of 1,120 illnesses, 700 medicinal plants, 64 preparations from mineral sources and 57 preparations based on animal sources. He along with his team conducted cataract, cesarean, factures and urinary stone surgeries. His team has conducted more than 3000 surgeries with help of more than 120 tools. 14. 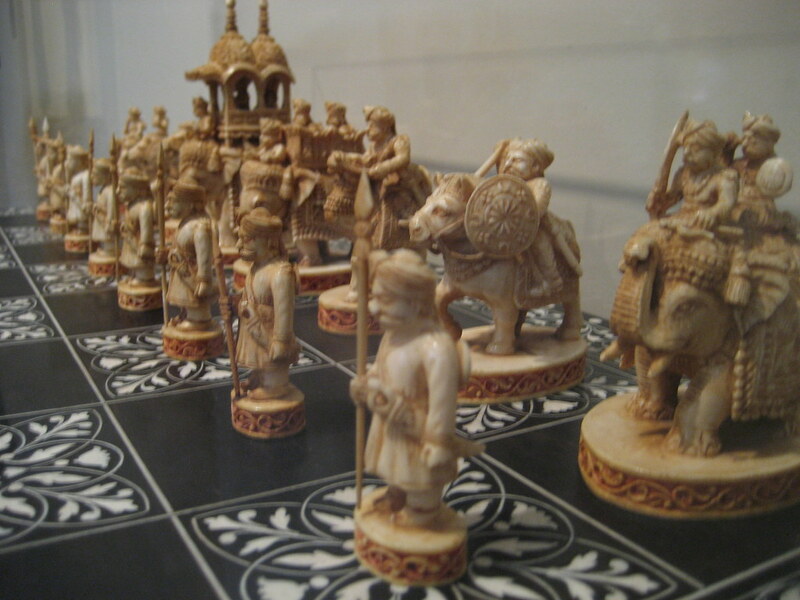 Chess was invented in India in 6th century. 15. Diamond mining and diamond tools. Diamonds were first recognized and mined in central India 5,000 years ago, where significant alluvial deposits of the stone could then be found along the rivers Penner, Krishna and Godavari. India remained the world’s only source of diamonds until the discovery of diamonds in Brazil in the 18th century. Golconda served as an important centre for diamonds in central India. Diamonds then were exported to other parts of the world, including Europe. 16. The game of Snakes and Ladders was invented in 13th century by saint Gyan Dev. 17. Buddhism and Jainism originated in India. 18. Indians established one of the first civilizations in the world called Indus valley civilization. Crucible steel is the form of steel that is popular for its wide range of applications in variety of fields from industries to home appliances. Scientific research showed promising evidence of crucible steel extraction processes in Kodumanal, near Coimbatore in Tamil Nadu during the period as early as 3rd century BC. 20. Buttons were Discovered in Indus Valley Civilization 5000 years ago. 21. Sir Jagadeesh Chandra Bose invented Crescograph, a device which measures the growth in plants. 22. The board game LUDO is a modified version of indian invented game called Pasichi. 23. Earliest traces of Ruler/Scale was observed during Indus valley civilization. 4th century BCE Indian epic poetry and the Vedas give the earliest written mention of South Asian martial arts. Boxing, wrestling, swordsmanship, archery, and the use of numerous weapons are all described in detail. The purpose of Stepwells is mainly to cope with seasonal fluctuations in water availability Research states that they were first made in India and then propagated to other parts of Aisa. 27. Yoga originated in India. Yoga is now the most adopted fitness and health practice around the world. In the year 1780 the Mysorean dynasty under the rule of Hyder Ali and his son Tipu Sultan made the first successful use of iron-cased military rockets in the history of the world to fight against the British East India Company in the battle of Guntur. The British were exposed to this technology after defeating the Mysore Dynasty. Their research in the Mysorean rockets lead to the development of the famous Congreve rocket and the rest is history.